Oil on canvas, 54 x 47 cm. 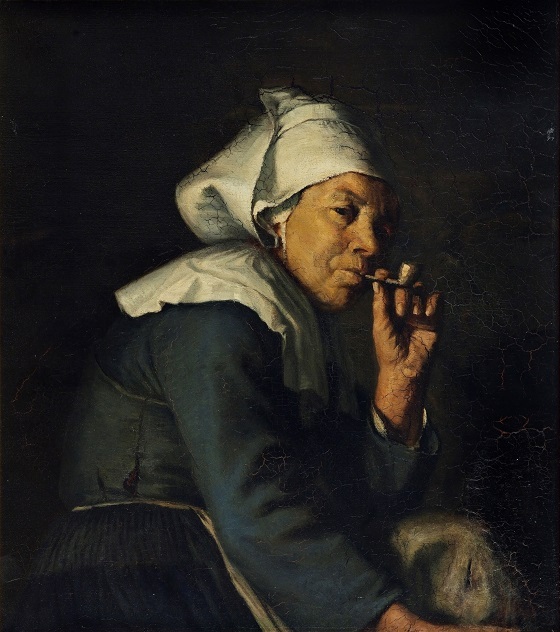 With a roguish facial expression, a French peasant woman turns to face the viewer while smoking her pipe. She is sitting in a hunched position and appears at this very moment to have taken a short – and much-needed – break from her household chores. It is hard work, as evidenced by her dirty dress and apron as well as the rough hand holding the pipe. The dark colour scheme and objective depiction of the peasant woman gives the painting an unpretentious, candid and regular expression. The genre painter H.C. Koefoed painted several works of people going about their everyday chores, and life among the local agricultural and fishing communities became a recurring subject. His interest in the life of the commoners was reignited during his stay in Brittany, where alongside depicting the region’s scenic landscapes he also enjoyed painting portraits of the local farmers and fishermen.